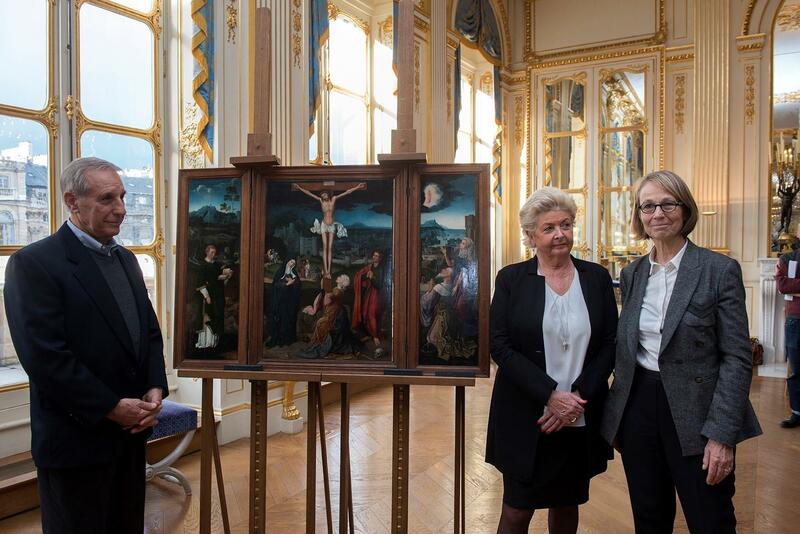 Standingwith French Culture Minister Françoise Nyssen, Christopher Bromberg and Henrietta Schubert, grandchildren of Henry and Hertha Bromberg, view Flemish painter Joachim Patinir's Triptych of the Crucifixion, which was returned to them Monday by the French state. Paintings looted by Nazis during World War II, are on display at the Louvre museum, in Paris. 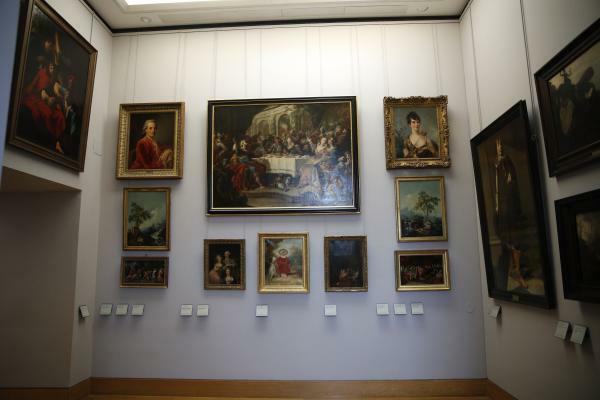 In a move aimed at returning work of art looted by Nazis during World War II, the Louvre museum has opened two showrooms with 31 paintings on display which can be claimed by their legitimate owners. The 31 paintings include French, Italian and Flemish artists — eclectic works from various periods that once were destined for the personal collections of Nazi officials and an art museum Hitler was planning for Austria. What the paintings have in common is that they all were stolen or obtained through forced sales from Jewish families. Louvre curator Vincent Delieuvin says the display is a symbol to remind people that the museum has not forgotten. "Unlike in the regular collections, we've hung the paintings closely together to evoke the intimateness of a private home," he says. "We want to find the rightful owners of these paintings, but we also want these rooms to serve as a place of memory — a place where people can come reflect on this terrible time in history where Jewish families fled or were killed and their artworks were plundered." Parisian Collete Grillot, 86, felt it was important to come view the paintings. "I lived through the war when I was a child and it has marked my whole life," she says. "I'm not Jewish, but at school I had a Jewish friend who wore the Star of David." Valerie Sutter, a French teacher from Florida, also visited the museum to take in and reflect on the collection. "I find this fascinating," she says. "That they're still looking, and that they're still hoping to find the owners. I find that very touching, very worthy." Others are not sure how worthy the Louvre's efforts have been. The exhibit has been criticized for lacking historical context and for being relegated to two tiny, obscure rooms. Lawyer Corinne Hershkovitch says the Louvre only really has become proactive on the issue of Nazi-looted artwork in the past few years. In 1999, Hershkovitch successfully sued the Louvre to get back several paintings that were sold at auction in 1941, a year after their owner's death. While the sale of the artwork appeared to have taken place legally, Hershkovitch argued that the fact that the owner's children were unable to attend — because they had fled Nazi-occupied Paris — made it a forced sale. Hershkovitch won. "They've done too little, too late," she says of the Louvre. "And there's sometimes been this whole sentiment of 'why are you coming to bother us with this 50 and 60 years later?' "
The Louvre currently has custody of around 800 stolen or forced-sale paintings whose owners are still unknown. Most are hanging in museums across France. Curator Delieuvin says that's to give them maximum exposure to the public. For Hershkovitch, putting museums in charge of giving back artworks was the first mistake. "Curators want to conserve paintings," she says. "That's their job." She admits that most families who get artworks back usually do sell them, so not only does the museum lose an important work, but it sees it go on the market to be bought by another museum or a private collector. During World War II, the Nazis took around 100,000 artworks from France. Some 60,000 were brought back to France after the war, and 45,000 of those immediately were reclaimed by their owners. Then, says Hershkovitch, everything slowed to a halt. "The Jews wanted to reintegrate into French society and the French wanted to forget about the collaboration, so there was a kind of consensus to pull a veil over all this and move on," she says. Hershkovitch says all that changed with the next generation, who raised consciousness worldwide about the issue in the '90s. In 1998 in Washington, DC, 44 countries signed new international protocols for the identification and return of Nazi confiscated art." A seminal moment in France came with President Jacques Chirac's 1995 speech on the anniversary of a famous roundup of Paris Jews during the war. Chirac said the Velodrome d'Hiver roundup had been carried out not by the Nazis, but by French police. He said France, a country of enlightenment and human rights, had been complicit in Nazi barbarism. He called on the French to face this dark chapter in their history. It was the first time the country confronted its role in the deportation of some 72,000 Jews during the war. Hershkovitch says it was huge, and that "Chirac's speech changed things both morally and judicially." Hershkovitch says people had not come to terms with the country's collaborationist Vichy regime because the hero of the resistance, president Charles DeGaulle, had acted as if Vichy were not part of France. "He put Vichy in a sort of parenthesis of French history," she says. "And when you put something aside and don't confront it, you cannot solve the problem." In 1997 France launched a three year investigation into the theft of Jewish art under the Nazi occupation. The ensuing "Matteoli Report" offered propositions for finding and compensating victims and for increasing national awareness of Nazi looting. That eventually led to the creation of a working group to actively search for the artworks' rightful owners, instead of waiting for them to come forward. The group includes the French culture and foreign ministries, museum curators and the Shoah Foundation. The French culture ministry also has put its vast database of Nazi looted artworks, including photos, online. Delieuvin says that database is the best way to link a looted painting to its rightful owner, which he describes as a very complicated process. "The other day a family came to us with a picture of the work and we found it on the database," he says. But Delieuvan says most often there's no picture or even the name of the person who once owned the art. Many art sales took place during the war, but not all of them were forced sales. Delieuvin says that if a work was sold at auction it is much easier to track, because records can be obtained showing the buyer and the seller. "If the seller was Jewish, then there's a good chance it was a forced sale," he says. But plenty of non-Jews also sold works to Nazis during the war. If it was a private sale, Delieuvin says there's usually no trace of who the seller was. France is still conserving about 2,000 artworks that are thought to have been looted or obtained through forced sales by Nazis. Only around 100 have been returned since the 1950s. American Christopher Bromberg has gotten back two of his family's artworks. Bromberg's grandfather was forced to sell his paintings quickly as he fled Nazi Germany in 1938 through Switzerland and France to reach the United States. In a ceremony in Paris last week, French culture minister Françoise Nyssen returned a 16th century Flemish painting to Bromberg and his sister Henrietta Schubert. Nyssen called the restitution of the plundered work a struggle for justice and memory. "This is a moment of pain and of hope," she said. "After 70 years and much searching, this painting has been returned to its rightful owner." Nyssen promised France would continue to fight relentlessly for the return of Nazi looted artworks to their rightful owners. In 2016 Bromberg was handed over another one of his grandfather's paintings in a similar ceremony. "There's this feeling of thanks and gratitude that is more valuable than the paintings themselves," he said. "It's the society that I want to take my hat off to, that allows this kind of event to take place." The Louvre Museum in Paris is trying to write a decades-old wrong. It has designated two rooms for paintings looted by Nazis. Those paintings' owners have never been found. The museum says the exhibit is part of a continuing effort to find the rightful owners of the artworks. NPR's Eleanor Beardsley reports. ELEANOR BEARDSLEY, BYLINE: The 31 paintings are French, Italian and Flemish, eclectic works from various periods. They were once destined for the personal collections of Nazi officials and the art museum Hitler was planning in Austria. Louvre curator Vincent Delieuvin says the display is a reminder that the museum is still looking for the paintings' owners. VINCENT DELIEUVIN: (Through interpreter) The paintings are hung closely and intimately to evoke a private home because we also want these rooms to serve as a place of memory where people can come and reflect on this terrible time in history where Jewish families fled and their artworks were stolen. BEARDSLEY: Eighty-six year old Collete Grillot has come to see the collection. COLLETE GRILLOT: (Through interpreter) I lived through the war when I was a child, and it has marked my whole life. At school, I had a Jewish friend who wore the Star of David. BEARDSLEY: Valerie Sutter is a visiting French teacher from Florida. VALERIE SUTTER: I find this fascinating, that they're still looking and that they're still hoping to find the owners. I find that very touching, very worthy. BEARDSLEY: Others are not so sure. Corinne Hershkovitz is a lawyer who helps families find and retrieve stolen artwork. She says this exhibit is awful because it offers no historical context, and the Louvre has only become proactive in the last few years. CORINNE HERSHKOVITZ: (Through interpreter) They've done too little, too late. And then there's often been this whole sentiment of why are you coming to bother the museum with this 50, 60 years later? BEARDSLEY: Today the Louvre holds 800 stolen or forced-sale paintings whose owners are unknown. During the Second World War, around a hundred thousand artworks were taken from France by the Nazis. Some 60,000 were recovered right after the war. Forty-five thousand of those were immediately reclaimed by their owners. Then everything slowed to a halt in the '50s, says Hershkovitz. HERSHKOVITZ: (Through interpreter) Jews wanted to reintegrate into French society and the French wanted to forget about the collaboration, so there was a kind of consensus to pull a veil over all of this. BEARDSLEY: Hershkovitz says that changed with the next generation, and in the 1990s there was a raising of consciousness worldwide over the issue. Forty-four countries signed international protocols for the identification and return of stolen art in 1998. Soon after, the French government created a commission to actively search for the artworks' rightful owners. And with the Internet, the French Culture Ministry's vast database of stolen art works, including photos, has become available to everyone. That's how American Chris Bromberg found his grandfather's paintings. BEARDSLEY: In a ceremony last week in Paris, the French culture minister, Francoise Nyssen, returned a 16th-century Flemish painting to Bromberg. BEARDSLEY: The French government returned another of Bromberg's grandfather's paintings to him in 2016. CHRIS BROMBERG: There's this feeling of thanks and gratitude that is more valuable than the paintings themselves. It's the society that I want to take my hat off to that allows this kind of event to take place. BEARDSLEY: Despite many lost years, Nyssen promised France would fight relentlessly for the return of Nazi-looted artworks to their owners. Eleanor Beardsley, NPR News, Paris. (SOUNDBITE OF HOMESHAKE SONG, "GIVE IT TO ME") Transcript provided by NPR, Copyright NPR.